I’m In Love. That’s the title of the opening track, but also my reaction to this blissed-out shimmer of fuzzy pop. They rhyme mystery with trajectory –it may not sound much to you but it means the world to me. 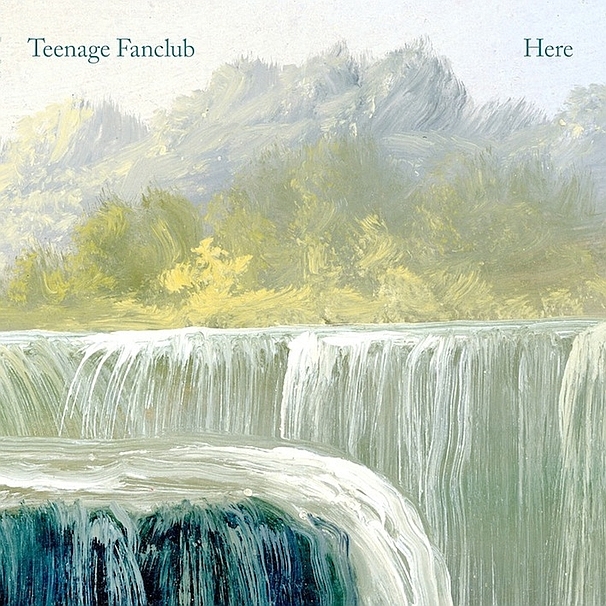 Once the flannel-shirted Scottish anti-grunge movement – supplying sweet melodies and slightly acerbic lyrics to counter that dreary wave of American guitar rock – Teenage Fanclub have grown up and moved on. Grungey fuzz like best-known albums, Bandwagonesque and Grand Prix saw them almost famous but here, “Here”, on their tenth album and in their fifties, they are settled and happy with their role as much-adored cult icons – issuing tales of their age and words of wisdom from the higher branches of indie’s tree. This set, their first in six years, continues the pattern of the last album or two but ramps up the formula. The overall atmosphere is happy, warm, loved, loving, calm and full of rock instruments played gently, with love. Even the guitar solos have a silver edge. Still indebted to Mr Slowfinger, Neil Young, solos are simple, steady and heartfelt. Right from the opener, a warm, fuzzy tone pervades. Very Creation Records, very late-period Byrds. Soft melodies. “Isn’t life such a mystery”, they sing, “you come to me with your arms open wide”. Thin Air opens on glam-rock guitar reminiscent of Jim Lea from Slade. It’s about things they meant to do – so far, so dreamily middle-aged. Hold On says “Wake up. I’m alive. One more day. Hold on to your life, your dreams”. Gentle melancholy seeps through the kind words. The Darkest Part Of The Night croons “I’d do anything to see you come alive” to someone stuck in a dull rut. Next up is I Have Nothing More To Say – a top, sweet, chiming tune. A lovely slow fuzz-guitar solo, as slow as a Crazy Horse plod graces the venture. I Was Beautiful When I Was Alive is very late-sixties. Psychedelic thoughts about sailing away from the self and flying. The First Sight is light and full of air and icing sugar. Horn sounds add an element of Arthur Lee and Love. Live In The Moment is also a contemporary member of the current sixties Pysch revival. A punchy, horny chorus echoes Love again before a brief but big solo. This is a relaxed, sweet, mature album. An aging gracefully and echoing the reflections of their audience in their better moments. A showcase of how rock can age with taste and cool.